Individual patient implants are often the drug of choice for tumors, congenital malformations or accidents. In such cases, people often suffer from severe bone defects. Such defects are very stressful for a patient and severely limit his quality of life. Treatment involves implants that stabilize the weakened bone either temporarily or permanently. In each patient the defect is different. As a result, a supply of standard implants often fails to produce a satisfactory result for the patient. We have addressed this problem by exploring ways to create individual patient implants that allow for the individualized care of a patient. Today we are able to produce an implant with individual geometry for each patient using the most modern manufacturing techniques. The individual implants are manufactured via so-called additive manufacturing processes, also known as 3D printing. Thus, the requirement of a high geometry complexity can be met. The creation of an individual implant is a hurry and has to be done within a few days. 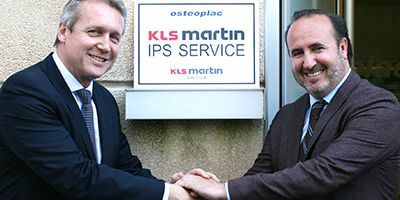 With the establishment of KLS Martin IPS Service, we will now achieve an even faster and more efficient design, ordering, and shipping process of individual patient implants in Spain and Latin America. All with the aim to achieve an even better treatment of the patient.